XIOM Template is a modern and elegant template, created for Software, WebApp & SaaS Product related website. It is designed with unique concept, clean & minimal. XIOM is a very good template, which helps you create any kind of software related website. 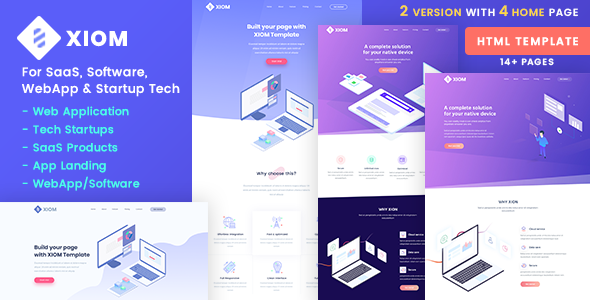 XIOM HTML template included all the necessary benefits and special features that perfectly fit for SaaS, Software, WebApp and Startup Tech website or any type application related website. XIOM is definitely a great kick starter for your next web projects. XIOM SaaS Template template comes with 4 Home Pages that used for app landing, software landing, webapp. It also has some important pages as about, features, login, pricing etc page. Note: This is NOT WordPress theme and you can’t install into WordPress website as this is HTML template. Special Note: All images are for preview purposes only and images cannot be supplied in package file and have been blurred heavily. For illustration/isometric image, you can purchase our psd template separately.